What struck me about it were the number of scraps of paper sticking out of the top, each bookmarking something I wanted to cook. has by far the most. Food is symbolic to many people and religions…it provides more than mere nourishment. It’s a part of ritual and tradition, a way of solidifying a cultural and religious identity. Published in 1997, Roden’s book charts the development of Jewish culinary tradition through the ages and describes how the Jewish people’s experiences, their travels around the world, led to the creation of a rich store of recipes and tradition centred around food. This is a stunning account, one that maintains it’s focus on food, but which seeks also to describe the political, social and above all the religious context of that food. Here is the story of the Jewish people, told through their food, and this duality is what makes this book such a success. The book covers recipes and food from every part of the Jewish world, from Russia, Poland and Germany, England and America, North Africa and the Middle East right through to India and the Far East. There’s breadth, but there’s also cohesion – the many and varied recipes are bonded together through the shared Jewish experience, an experience that Roden articulates so clearly. I bought this book on it’s publication, and I’ve gone back to it regularly ever since, reading a chapter here and there about a branch of the Jewish family and their particular traditions. Roden’s introductory essays are absorbing and thoughtful – she provides clear context for the recipes that follow, seting out how they came to be and why they’re important. I read today about the development of Anglo-Jewish cuisine, about the influence of French, Spanish and Portuguese food on British Jewish food, and later the influence of Russian and Eastern European food, brought to Britain by Jewish immigrants from those places. The lasting legacy of Jewish food on wider British cooking has been light, but Roden tantalisingly notes the similarity between that terribly British staple of fried fish in batter and a similar Jewish dish, which was normally eaten cold. are secondary, there to punctuate and illustrate the wider cultural story, but this reading misses the point. Roden’s is a book that seeks to explore the connections, and to prove, through her recipes that those connections are still vital, alive. has a scale and depth that’s quite daunting and impressive. It’s a scholarly book that’s punctuated with Roden’s lucid observations and her own, wide experiences. There is much good food to cook, and a meal with a history, a story, is all the better. My sister in law gave me this book years ago so I'd know how to take care of her brother. Very interesting book. provides more than nurishment, it feeds the soul. I'm not familiar with this book, but I'll be looking for it. I love the stories behind the food as much as I love to cook (and eat). I just finsihed reading a book by Laurie Colwin — I mean I devoured it. So much more is on one's plate than food. Ms Colwin also happened to have a fascination with English food! The book is "Home Cooking" and there are two volumes of essays. I'm off to get number 2. An excellent review … I have been exploring Jewish recipes of late from a lightweight book of Jewish cuisine. I'm finding I love the way vegetables are treated in the recipes I've tried. Your discussion makes me want to check this book out … thanks! 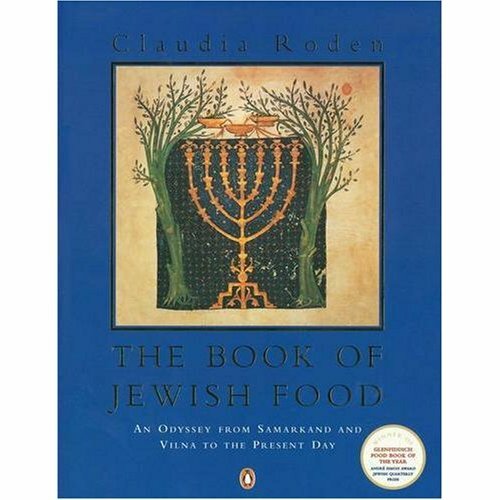 Claudia Roden is the interpreter of world wide Jewish Cuisine. Thank you for writing about this marvelous book, it has an honored place on our shelves.